Thanks to an insider for SamMobile, leaked images show that Samsung may be getting ready to release another phone- this one a sibling of the Samsung Galaxy S3 mini. 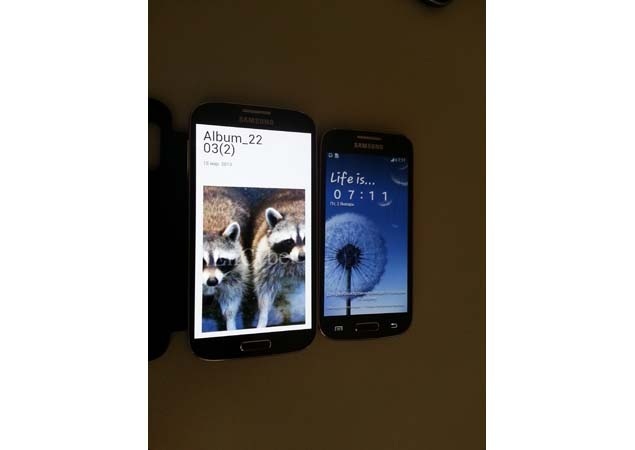 These photos show a device with the same design layout as the Galaxy S4 but in a much smaller form, just as the S3 mini was a copy of the Galaxy S3. The Galaxy S4 mini (or model number GT-I9190 as it is currently being called,) has a 4.3-inch screen, runs Android 4.2 with TouchWiz skin just like the S4, and has a Super AMOLED screen that is said to have 256ppi pixel density, compared to the S4’s 441ppi. It’s also said to come with a more modest 1.6GHz dual-core processor instead of the S4’s 1.9GHz quad-core. This means people looking for a smaller version of the Galaxy S4 will have an option, however they will definitely have to compromise what is inside. According to SamMobile, the Galaxy S4 mini is expected to be launched sometime in June or July this year, although Samsung is yet to confirm whether the handset is even in production.